Author: Emile Gille Nguendjio. Series edited by: Wilhelm J.G. Möhlig, Bernd Heine. This book is a descriptive grammar which, from a high intellectual standpoint, presents the phonological, tonal, morphological and syntactic structures of Báŋgwà, one of the dialects of Ndà'Ndà', a Bantu language of the grassfields of Cameroon that is spoken by about 10,000 people (Source: SIL 1990) in the village of Bangoua. It constitutes a major base for the development of pedagogic grammars for Secondary and High Schools. 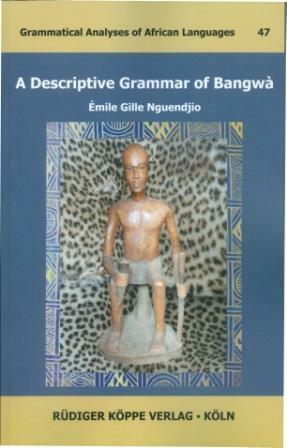 Its theoretical nature and potential didactic usage give it a multidimensional scope making it indispensable to descriptive linguists on one hand and to students and teachers of Cameroon Languages ​​and Cultures on the other hand, who will find in it, an inexhaustible source of structural illustrations for the Ndà'Ndà' language itself, the Bantu grassfields languages ​​and the Bantu languages in general. Émile Gille NGUENDJIO is a devoted and seasoned educator of broad interests and notable achievements. He is the Head of Department of Bilingual Letters and Dean of Studies of the Higher Teacher Training College (HTTC) Bambili, The University of Bamenda. Holder of a Doctorat 3ème Cycle in African Linguistics from The University of Yaoundé. He is very attuned and sensitive to the moods and needs of his academic milieu. He has been teaching African Linguistics and French Linguistics in the Department of Bilingual Letters. As a teacher who has always wished to combine grammar teaching with a broadly communicative methodology, he published two major and invaluable resource workbooks in Collection FRENCH, to facilitate the teaching/learning of French as a second language to Anglophones. Gazing on unscaled heights and new horizons, his contribution in the domain of Linguistics is both holistic and multifarious. 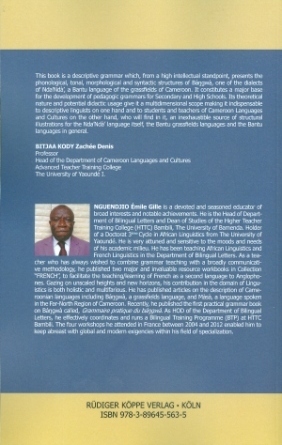 He has published articles on the description of Cameroonian languages including Báŋgwà, a grassfields language and Màsà, a language spoken in the Far-North Region of Cameroon. Recently, he published the first practical grammar book on Báŋgwà called, Grammaire pratique du báŋgwà. As Head of Department, he effectively coordinates and runs a Bilingual Training Programme (BTP) at HTTC Bambili. The four workshops he attended in France between 2004 and 2012 enabled him to keep abreast with global and modern exigencies within his field of specialization.